Sydney artist Sarina spent her childhood on the NSW Central Coast where she acquired not only a love for the sea, but also the creativity that today infuses her art. She paints according to her moods & inspiration….textured, aged & patterned still life, sea scapes and coastal views on canvas and paper which may involve layering materials like watercolour, acrylic, oils, inks, plaster, sand & gold leaf, sewing & stitching in nails, ropes, beads and shells before finishing with glazes or resin to simulate the luminosity of water. 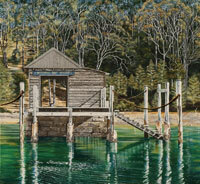 Paintings by Sarina are usually in bright Australian colours: mostly blues, greens & aquamarines. She uses shades of blue and turquoise to calm and soothe, reminiscent of relaxing beachside holidays and time spent in the sun and surf. 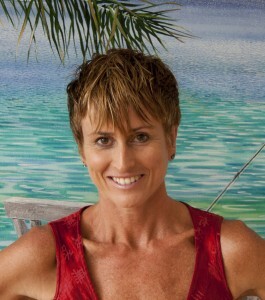 Perpetually exploring new concepts and developing the innovative techniques that distinguish her work, she enjoys the freedom her art offers both artist and audience. The nature of her paintings means she feels neither bound to explain them nor cares how they’re interpreted. She paints what she sees and loves, that which inspires and gives her a sense of great beauty and happiness. They are paintings which inspire, paintings people can live with in their house and which give them a sense of happiness, peace & tranquillity every time they are seen. Sarina’s first solo exhibition in 1995 at Sydney’s Arthouse Gallery resulted in the sale of 40 paintings in less than two weeks and she has been painting prolifically ever since to keep up with demand. She has held 7 major Solo exhibitions and also participated in many group shows.